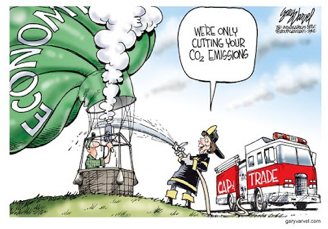 by Seton Motley, Contributing Author: Remember “Cap and Trade?” The anti-market allegedly “market-based” “solution” to man-faked global warming climate change? A central authority (usually a governmental body) sets a limit or cap on the amount of a pollutant that may be emitted. The limit or cap is allocated and/or sold by the central authority to firms in the form of emissions permits which represent the right to emit or discharge a specific volume of the specified pollutant. Cap and Trade is Dead (Really, Truly, I’m Not Kidding)Except with this President, no terrible idea dies just because the Constitutional process demands it. (Environmental Protection Agency) EPA: If Congress Doesn’t Pass Cap-and-Trade, We WillAnd so they have. Here’s the EPA’s “Cap and Trade” page. And in government, terrible ideas are like kudzu – they rapidly, illegally spread everywhere. The U. S. Department of Agriculture (USDA) and the Environmental Protection Agency (EPA) have announced an expanded partnership to support water quality trading.… Oh look – the government is assaulting our farmers’ water supply. Where else have we seen that?The EPA is Turning Water on Farms Into a Weapon Against FarmersThe EPA exists to assault the private sector. And it is teaming up with other government departments to maximize the damage. The USDA is a complete waste of money, time and space. Humans have engaged in agriculture for 10,000 years – we did so for 9,900 of those years without a government department. I think we've got this. And, of course, there is zero Constitutional authority granted to the federal government to have a USDA. Having no useful purpose, the Department of Agriculture works day and night to make private agriculture more difficult and expensive. Which raises our food prices – and makes our farmers less competitive on the now-global market. These government-inflicted regulations and costs – by a department that shouldn't exist – foster other government programs that shouldn’t exist. Like the horrendous Farm Bill. Government makes it nearly impossible for farmers to turn a profit – then subsidizes them. Like Food Stamps. Government jacks the price of food – then buys tens of millions of people food at the government-inflated prices because they can no longer afford it. The Obama Administration is assaulting the private sector with every department, agency, commission and board at its $4-trillion-a-year disposal. Including unilaterally imposing “Cap and Trade” across multiple agencies. And what has transpired during the Obama Administration’s tenure? Food Stamp Growth 75X Greater than Job CreationIt would seem there is a correlation there. Tags: Seton Motley, Less Government, Cap and Trade, Never passed, Congress, Government takeovers, Big Government, kudzu To share or post to your site, click on "Post Link". Please mention / link to the ARRA News Service. and "Like" Facebook Page - Thanks!